Home › PITTSBURGH › Pittsburgh Vol. 4, Shirt 17: "Pittsburgh Hockey Co."
Pittsburgh Vol. 4, Shirt 17: "Pittsburgh Hockey Co."
Available EXCLUSIVELY ONLINE through April 28th, then it's gone! $8* from every sale will be donated to the Adam Gress Scholarship Fund. Adam Gress passed away suddenly and unexpectedly on December 21, 2017 at the young age of 26 from an undiagnosed heart condition known as Hypertrophic Cardiomyopathy. 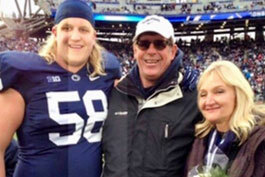 Adam graduated from Penn State University in 2013 where he had double majored in Telecommunications and Broadcast Journalism and was a Penn State Football Letterman. Adam was living in Pittsburgh working as a home builder and was months away from marrying his long time fiance. Adam had the unique ability to be able to make those around him smile and will always be remembered for his kindness and humor as well as his love of music, the Pittsburgh Penguins, and his unwavering commitment to his family and friends. Adam truly loved life and made this world a better and happier place. A scholarship fund has been created in Adam's memory. This will be an annual scholarship for future Penn State Football players and will be a lasting tribute to Adam. Please consider a shirt purchase to support this scholarship, or a donation to its online fundraiser.